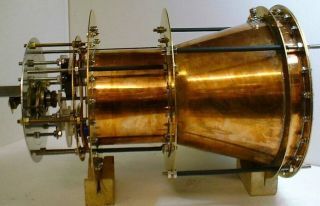 The "impossible" EmDrive engine, which purportedly generates thrust by bouncing microwaves around inside a cone-shaped chamber. The laws of physics have won again, it would appear. For the past few years, researchers at NASA's Eagleworks advanced-propulsion lab have been putting a controversial and potentially revolutionary space engine called the EmDrive to the test. And the NASA team's work has given EmDrive enthusiasts some reason for optimism, detecting small amounts of thrust in lab tests of the device. But now we get to the "controversial" part: The EmDrive really shouldn't work. The engine doesn't blast anything out a nozzle, so Newton's Third Law of Motion — for every action there is an equal and opposite reaction — doesn't come into play. Nobody really understands how the claimed thrust could actually be generated. And now it seems that the previously detected thrust was illusory, at least according to a team of researchers in Germany. They built their own EmDrive and tested it in a vacuum chamber, as the NASA researchers did. The German team picked something up as well. But follow-up analysis "clearly indicates that the 'thrust' is not coming from the EmDrive but from some electromagnetic interaction," the researchers wrote in their new study, which you can read here. That interaction is likely between EmDrive power cables and Earth's magnetic field, the team concluded. The German team, which was led by Martin Tajmar of the Institute of Aerospace Engineering at Technische Universität Dresden, also presented its results last week at the Space Propulsion 2018 conference in Seville, Spain. The new results probably won't be the last word on the EmDrive; other researchers may want to take a crack at it as well. But if you've been counting on this impossible engine to help humanity get out among the stars, you may want to recalibrate your expectations.